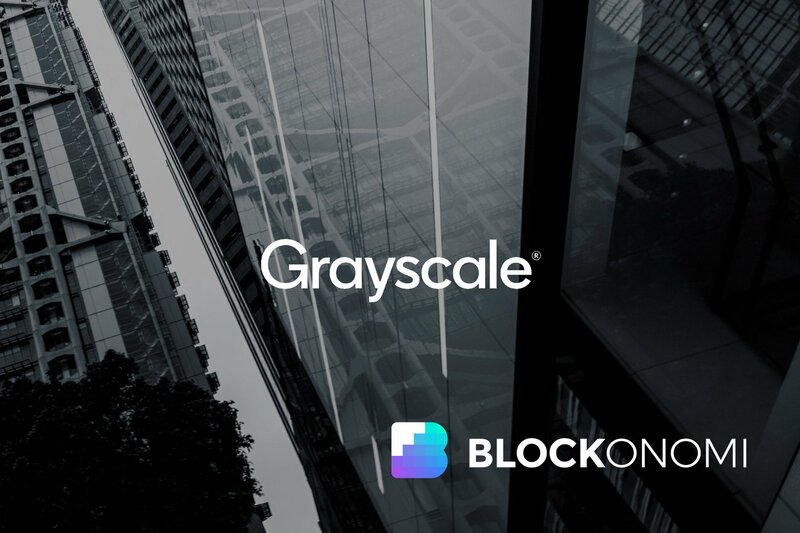 Grayscale, the investment company behind over-the-counter cryptocurrency products such as the Bitcoin Investment Trust and the Ethereum Classic Investment Trust has just released their first annual report. The good news is that they saw a 2018 influx of just under $250 million in new investments – more than half of which came from what they call institutional customers. The bad news is that naturally, anyone who invested in January saw upwards of 69.4% losses. Grayscale is an investment firm that specializes in offering cryptocurrency-based investment trusts and other products through OTC markets. This means that from a functional level, their products operate in a manner very similar to conventional stock exchanges. However, according to their report, their products are not registered with the SEC as they apparently do not require registration. Grayscale Investments was set up by Digital Currency Group back in 2013 and has become a one-stop shop of sorts for those looking to get exposure to digital currencies without actually holding them directly. Currently, the group offers investment products that give exposure to bitcoin, Ethereum Classic, Zcash, Ethereum, Bitcoin Cash, XRP, and Litecoin. The firm also offers a product it calls Digital Large-Cap Fund. Grayscale has been particularly interested in the development of Ethereum Classic, as the group is one of the key organizations behind the new Ethereum Classic Summit, the second of which will be held in South Korea later this year. The report itself is only a few pages long, but it provides a number of interesting points that reflect on an aspect of digital assets that may not be apparent from just reading price charts. The report states that since the beginning of 2013, the group has seen $248.39 million invested into Grayscale products, which breaks down to $9.55 million per week. What’s also interesting is where this money is coming from. The report states that 56% of all investment for 2018 has come from institutional investors. The average investment for institutional investors is $848,000. The next largest investment group is accredited individuals, followed by retirement accounts, and lastly family offices. Accredited individuals average $289,000 each. Of these investors, 64% are US-based, 26% are based in the Cayman Islands, and 10% come from other territories. One section of the report was dedicated to the performance of the individual investment products themselves. A chart lists two categories. One is the performance of the fund from the beginning of 2018 to now, and another includes the total performance since the launch of the product. Unfortunately, the majority of products only launched this year and so the amount of data this section includes is somewhat limited as a result. Regardless, this is what the report states. The Bitcoin Investment Trust is down 59.8% this year, but is up 4107.1% since launch. Ethereum classic is down 47.7% this year, but is up 270.3% since launch. The Zcash Investment Trust didn’t fare quite as well, with it down 69.4% this year, and down 30.1% since launch. The Ethereum Investment Trust is down 43.9% this year, and a little less since inception. 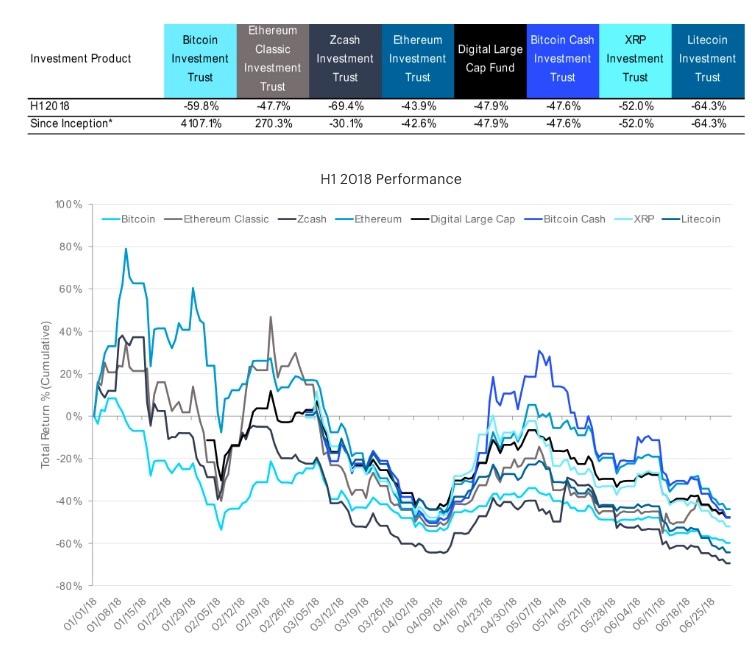 The remaining four products all seem to have launched this year and are all down between 47.9% with the Digital Large-Cap Fund, and 64.3% with the Litecoin Investment Trust. These numbers don’t come as much of a surprise, however, as we all know that 2018 has been a very hard year for cryptocurrencies. That is, only when we consider where they were in January to where they are now. If we don’t factor in the massive bull run in December and January, prices have actually been on a slow and steady increase for the last two years, which is why the two investment products Grayscale offers that have been running for quite some time see large returns overall since the launch of each respective fund. Particularly, the Bitcoin Investment Trust with its unbelievable 4100+ percent gains. One final point we’d like to discuss from the report is to which digital currency most investments in Grayscale products are going. It comes as no surprise that bitcoin is still leading the pack by a large margin. More than half of all investments made in Grayscale products were towards the Bitcoin Investment Trust. While other currencies are seeing investment and some degree of growth, bitcoin is still consuming the lions share of all investment funds. This makes sense for a number of reasons. Obviously, bitcoin is the most well-known digital asset and requires the least amount of explanation to new investors of blockchain assets. Secondly, bitcoin operates very similarly to an index fund, in that its value is often representative of the market as a whole. Simply put, if bitcoin is up, the market is up and vice versa. What that means is that for investors that just want exposure to digital assets, investing in bitcoin is still the easiest way to do that. And of course, with 4107.1% gains in the last five years, it’s difficult to argue that bitcoin would not be a wise choice.